Accommodation for up to 10 charter guests in 5 staterooms in the following layout: The luxury Amels yacht's Master Stateroom is situated forward and on deck and provides a King sized bed with a His & Hers ensuite bathroom and a separate private study. The yacht's full ensuite boasts it's own Spa Pool hot tub & shower. There is also a 42 inch Plasma screen with TV & DVD & CD in the room. The Below Forward and to Aft Port Guest Stateroom has a Queen sized bed, a ensuite bathroom with tub & shower and a 36 inch Plasma screen with TV & DVD & CD & Stereo. Below Forward and to Aft Stbd Guest Stateroom has a Queen sized bed, an ensuite bath with a tub & shower and a 36 inch Plasma TV & DVD & CD & Stereo. The Amels yacht’s Guest Below Aft and to Port Stateroom has Twin beds with an ensuite bath and shower and a 13” Plasma screen with TV & DVD. The charter yacht’s Below Aft and to Stbd Guest Stateroom has Twin beds, an ensuite bath with a shower, and a 13” Plasma screen with TV & DVD. Luxury charter yacht LADY IN BLUE is a recent (2004) 52 meter (170’) Amels motor yacht. LADY IN BLUE was built and engineered by Amels of Holland with naval architecture by Terrance Disdale. 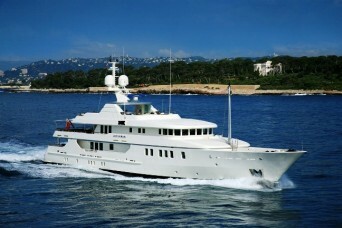 The renowned Paris interior specialists Studio Alberto Pinto was responsible for the yacht’s interior was designed by. This Amels 52 has a beautiful light, spacious and stylishly modern interior as well as a good range of indoor and outdoor water toys and amenities. This Amels motor yacht is the well proven 52 m hull, yet she provides an extra interior volume with the extension of her main superstructure which several meters over the usual 52m hull. The main sundeck and aft bridge deck lounge have been specially designed to accommodate larger numbers of guests and the yacht’s has well planned deck space and. She offers guests everything they could imagine with her interior volume has been increased by extending the superstructure several meters over a well-proven 52-metre hull form. LADY IN BLUE’s top sundeck and after bridge deck lounge are designed to accommodate a large number of guests. 'Lady in Blue' provides charter guests with the following yacht charter amenities and extras: Tenders: two 19 foot Custom Ribs with 115 hp outboard engines, Towable water-toys: two 3 man sized Wave runner jet skis, and Various Beach Toys, Water skiis, and Snorkeling equipment. Entertainment on the charter yach't Main Salon includes Formal dining for 12 guests (adjacent to the yacht's Main Salon) and the dining area can be closed off, for privacy, with clever movable decorative panels. Lady in Blue's Aft Deck offers a large shaded area with comfortable seating and access to the swimming platform and Bridge deck. Her Sky lounge has a electronic entertainment center with 42 inch Plasma TV&DVD&CD, a console DJ, a Karaoke center, an authentic fire place and Casual dining area to the aft for six guests. Her Bridge Deck has a Shaded open deck with Casual dining for 8 charter guests, aft couches with table and 4 comfortable cushioned chairs (all free standing). The yacht's Sun Deck offers a Spa Pool, Sun pads, a Bar, a Treadmill and Step Machine, as well as great convertible sun beds. Lady in Blue's other Entertainments include Satellite TV and mini M Video & DVD libraries and CD & DVD players, a Digital Satellite System with five receivers, Communications high-speed WiFi internet is throughout the yacht (for easy laptop conectivity). Satellite Communications throughout the yacht, include two sat phones (voice and data), Scuba Diving is by Rendezvous/organised diving.